This (geo)graphic comes from the World Elections blog. So, the press coverage of the Iranian election has been somewhat bewildering. It has been bereft of any real discussion of the political and clerical institutions that drive Iranian politics, as well as of any real discussion of the various groups, their worldviews, and their interests. But, that is hardly new. Then into my inbox comes STRATFOR’s coverage on the election. Below is the piece that came today. Not surprisingly, it in no way comports with the information (if it can be called that) being conveyed by the press (e.g., WashPost, network news, cable news, and I will even blame Jon Stewart). Is it that institutional journalism is reporting the facts, and George Friedman is force feeding us with the world filtered through a geopolitics filter? Or, is it that institutional journalism has absolutely no useful frame of reference in to arrange the “facts” that they observe. I believe we are all suffering from the later. I dare any one of them to have George onto their show’s, or to reprint this piece in their pages. There really should be a some sort of service that you can send pieces like this to in order to figure out why no one else is describing the situation this way. I think I will ask Fred Hiatt and see what he thinks. Speaking of the situation in Iran, U.S. President Barack Obama said June 26, “We don’t yet know how any potential dialogue will have been affected until we see what has happened inside of Iran.” On the surface that is a strange statement, since we know that with minor exceptions,the demonstrations in Tehran lost steam after Iranian Supreme Leader Ayatollah Ali Khamenei called for them to end and security forces asserted themselves. By the conventional wisdom, events in Iran represent an oppressive regime crushing a popular rising. If so, it is odd that the U.S. president would raise the question of what has happened in Iran. In reality, Obama’s point is well taken. This is because the real struggle in Iran has not yet been settled, nor was it ever about the liberalization of the regime. Rather, it has been about the role of the clergy– particularly the old-guard clergy — in Iranian life, and the future of particular personalities among this clergy. Iranian President Mahmoud Ahmadinejad ran his re-election campaign against the old clerical elite, charging them with corruption,luxurious living and running the state for their own benefit rather than that of the people. He particularly targeted Ali Akbar Hashemi Rafsanjani, an extremely senior leader, and his family. Indeed, during the demonstrations,Rafsanjani’s daughter and four other relatives were arrested, held and then released a day later. Rafsanjani represents the class of clergy that came to power in 1979. He served as president from 1989-1997, but Ahmadinejad defeated him in 2005. Rafsanjani carries enormous clout within the system as head of the regime’s two most powerful institutions — the Expediency Council, which arbitrates between the Guardian Council and parliament, and the Assembly ofExperts, whose powers include oversight of the supreme leader. Forbes has called him one of the wealthiest men in the world. Rafsanjani, in other words,remains at the heart of the post-1979 Iranian establishment. Ahmadinejad expressly ran his recent presidential campaign against Rafsanjani, using the latter’s family’s vast wealth to discredit Rafsanjani along with many of the senior clerics who dominate theIranian political scene. It was not the regime as such that he opposed, but the individuals who currently dominate it. Ahmadinejad wants to retain the regime,but he wants to repopulate the leadership councils with clerics who share his populist values and want to revive the ascetic foundations of the regime. TheIranian president constantly contrasts his own modest lifestyle with the opulence of the current religious leadership. Recognizing the threat Ahmadinejad represented to him personally and to the clerical class he belongs to, Rafsanjani fired back at Ahmadinejad, accusing him of having wrecked the economy. At his side were other powerful members of the regime, including Majlis Speaker Ali Larijani, who has made no secret of his antipathy toward Ahmadinejad and whose family links to the Shiite holy city of Qom give him substantial leverage. The underlying issue was about the kind of people who ought to be leading the clerical establishment. The battlefield was economic: Ahmadinejad’s charges of financial corruption versus charges of economic mismanagement leveled by Rafsanjani and others. When Ahmadinejad defeated Mir Hossein Mousavi on the night of the election, the clerical elite saw themselves in serious danger. The margin of victory Ahmadinejad claimed might have given him the political clout to challenge their position. Mousavi immediately claimed fraud, and Rafsanjani backed him up. Whatever the motives of those in the streets, the real action was a knife fight between Ahmadinejad and Rafsanjani. By the end of the week, Khamenei decided to end the situation. In essence, he tried to hold things together by ordering the demonstrations to halt while throwing a bone to Rafsanjani and Mousavi by extending a probe into the election irregularities and postponing a partial recount by five days. The key to understanding the situation in Iran is realizing that the past weeks have seen not an uprising against the regime, buta struggle within the regime. Ahmadinejad is not part of the establishment, but rather has been struggling against it, accusing it of having betrayed the principles of the Islamic Revolution. 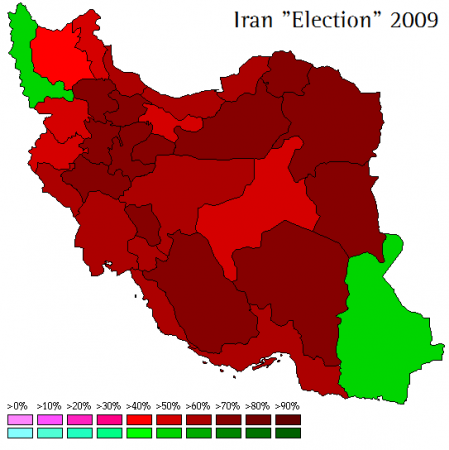 The post-election unrest in Iran therefore was not a matter of a repressive regime suppressing liberals (as inPrague in 1989), but a struggle between two Islamist factions that are each committed to the regime, but opposed to each other. The demonstrators certainly included Western-style liberalizing elements, but they also included adherents of senior clerics who wanted to block Ahmadinejad’s re-election. And while Ahmadinejad undoubtedly committed electoral fraud to bulk up his numbers, his ability to commit unlimited fraud was blocked, because very powerful people looking for a chance to bring him down were arrayed against him. The situation is even more complex because it is not simply a fight between Ahmadinejad and the clerics, but also a fight among the clerical elite regarding perks and privileges — and Ahmadinejad is himself being used within this infighting. The Iranian president’s populism suits the interests of clerics who oppose Rafsanjani; Ahmadinejad is their battering ram.But as Ahmadinejad increases his power, he could turn on his patrons very quickly. In short, the political situation in Iran is extremely volatile, just not for the reason that the media portrayed. Rafsanjani is an extraordinarily powerful figure in the establishment who clearly sees Ahmadinejad and his faction as a mortal threat.Ahmadinejad’s ability to survive the unified opposition of the clergy, election or not, is not at all certain. But the problem is that there is no unified clergy. The supreme leader is clearly trying to find a new political balance while making it clear that public unrest will not be tolerated. Removing”public unrest” (i.e., demonstrations) from the tool kits of both sides may take away one of Rafsanjani’s more effective tools. But ultimately,it actually could benefit him. Should the internal politics move against theIranian president, it would be Ahmadinejad — who has a substantial public following — who would not be able to have his supporters take to the streets. The question for the rest of the world is simple: Does it matter who wins this fight? We would argue that the policy differences between Ahmadinejad and Rafsanjani are minimal and probably would not affect Iran’s foreign relations. This fight simply isn’t about foreign policy. Rafsanjani has frequently been held up in the West as a pragmatist who opposes Ahmadinejad’s radicalism. Rafsanjani certainly opposes Ahmadinejad and is happy to portray the Iranian president as harmful to Iran,but it is hard to imagine significant shifts in foreign policy if Rafsanjani’s faction came out on top. Khamenei has approved Iran’s foreign policy under Ahmadinejad, and Khamenei works to maintain broad consensus on policies.Ahmadinejad’s policies were vetted by Khamenei and the system that Rafsanjani is part of. It is possible that Rafsanjani secretly harbors different views,but if he does, anyone predicting what these might be is guessing. Rafsanjani is a pragmatist in the sense that he systematically has accumulated power and wealth. He seems concerned about theIranian economy, which is reasonable because he owns a lot of it. Ahmadinejad’s entire charge against him is that Rafsanjani is only interested in his own economic well-being. These political charges notwithstanding, Rafsanjani was part of the 1979 revolution, as were Ahmadinejad and the rest of the political and clerical elite. It would be a massive mistake to think that any leadership elements have abandoned those principles. When the West looks at Iran, two concerns are expressed.The first relates to the Iranian nuclear program, and the second relates toIran’s support for terrorists, particularly Hezbollah. Neither Iranian faction is liable to abandon either, because both make geopolitical sense for Iran and give it regional leverage. Tehran’s primary concern is regime survival, and this has two elements. The first is deterring an attack on Iran, while the second is extending Iran’s reach so that such an attack could be countered. There areU.S. troops on both sides of the Islamic Republic, and the United States has expressed hostility to the regime. The Iranians are envisioning a worst-case scenario, assuming the worst possible U.S. intentions, and this will remain true no matter who runs the government. We do not believe that Iran is close to obtaining a nuclear weapon, a point we have made frequently. Iran understands that the actual acquisition of a nuclear weapon would lead to immediate U.S. or Israeli attacks. Accordingly, Iran’s ideal position is to be seen as developing nuclear weapons, but not close to having them. This gives Tehran a platform for bargaining without triggering Iran’s destruction, a task at which it has proved sure-footed. In addition, Iran has maintained capabilities in Iraq andLebanon. Should the United States or Israel attack, Iran would thus be able to counter by doing everything possible destabilize Iraq — bogging down U.S.forces there — while simultaneously using Hezbollah’s global reach to carryout terror attacks. After all, Hezbollah is today’s al Qaeda on steroids. The radical Shiite group’s ability, coupled with that of Iranian intelligence, is substantial. We see no likelihood that any Iranian government would abandon this two-pronged strategy without substantial guarantees and concessions from the West. Those would have to include guarantees of noninterference in Iranian affairs. Obama, of course, has been aware of this bedrock condition, which is why he went out of his way before the election to assure Khamenei in a letter that the United States had no intention of interfering. Though Iran did not hesitate to lash out at CNN’s coverage of the protests, the Iranians know that the U.S. government doesn’t control CNN’s coverage. But Tehran takes a slightly different view of the BBC.The Iranians saw the depiction of the demonstrations as a democratic uprising against a repressive regime as a deliberate attempt by British state-run media to inflame the situation. This allowed the Iranians to vigorously blame some foreigner for the unrest without making the United States the primary villain. But these minor atmospherics aside, we would make three points. First, there was no democratic uprising of any significance in Iran.Second, there is a major political crisis within the Iranian political elite,the outcome of which probably tilts toward Ahmadinejad but remains uncertain.Third, there will be no change in the substance of Iran’s foreign policy,regardless of the outcome of this fight. The fantasy of a democratic revolution overthrowing the Islamic Republic — and thus solving everyone’s foreign policy problems a la the 1991 Soviet collapse — has passed. That means that Obama, as the primary player in Iranian foreign affairs, must now define an Iran policy — particularly given IsraeliDefense Minister Ehud Barak’s meeting in Washington with U.S. Middle East envoyGeorge Mitchell this Monday. Obama has said that nothing that has happened inIran makes dialogue impossible, but opening dialogue is easier said than done.The Republicans consistently have opposed an opening to Iran; now they are joined by Democrats, who oppose dialogue with nations they regard as human rights violators. Obama still has room for maneuver, but it is not clear where he thinks he is maneuvering. The Iranians have consistently rejected dialogue if it involves any preconditions. But given the events of the past weeks, and the perceptions about them that have now been locked into the public mind,Obama isn’t going to be able to make many concessions. It would appear to us that in this, as in many other things, Obama will be following the Bush strategy — namely, criticizing Iran without actually doing anything about it. And so he goes to Moscow more aware than ever that Russia could cause the United States a great deal of pain if it proceeded with weapons transfers to Iran, a country locked in a political crisis and unlikely to emerge from it in a pleasant state of mind.